Factories are filled with a variety of loud aggressive noise sources that can combine to spike decibel levels to discomforting levels. OSHA guidelines require those levels to measure in at under 85 dBa, time weighted over an 8 hour period. Exposure levels that spike past this mark can cause a loss of hearing, absenteeism, employee turnover and potential OSHA fines. Ignoring the noise or relying on earplugs or headsets for hearing protection can prove costly to the company. Tackling the project head on with a custom designed noise mitigation plan protects both the employees in the plant and the long term viability of the company. NetWell welcomes the opportunity to resolve your noise issues. The focus on this page of our website is Step #1 in your journey to curb excessive Industrial Noise. 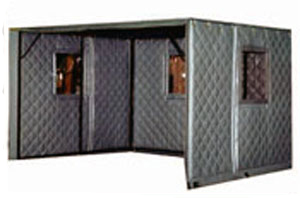 We first target the shutting down of your machine noise at its source with a noise enclosure. It is far more effective to tackle the noise at its “source” than it is to treat the “path” the noise is taking once the energy releases into your atmosphere. Sound Barrier Blankets can be custom sized to anchor to framing or structure built around your noise source to “house” the noise inside. This produces your most effective decibel level drops, but is practical only for stationary noise sources that can receive a full or partial noise enclosure. QBS Sound Barrier Blankets are class A fire rated sound barrier blankets that custom cut to match the cavity size of your project. 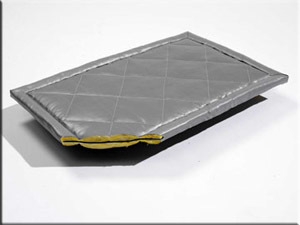 These blankets suspend via grommets, with velcro edging that allows you to seal sections together for a tight fit and minimal leakage. We can cut windows, hoods, vents, patches, openings, strip curtains, and a host of other components into the fabrication of your QBS Blanket System. These blankets can produce an average 15-20 decibel level drop, and keep your noise from releasing throughout your plant. This treatment is ideal for stationary noise sources such as grinders, compressors, generators, pumps and more. Many clients respond back that a full machine noise enclosure around the source is impossible. We respond with variations on the theme, one of which is to use the same QBS Blanket System in the form of a partially enclosed Dugout. Built like a baseball dugout, our acoustic sound enclosure solutions are custom sized to match the parameters of your machine. 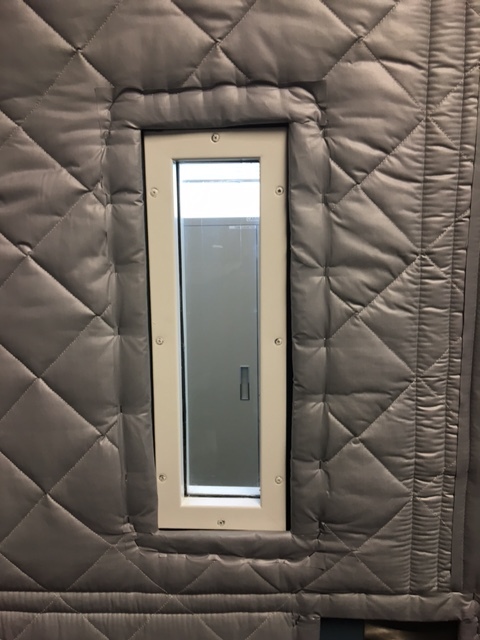 This soundproofing treatment is ideal for partial enclosures built around stationary noise sources that can receive partial, but not full enclosure treatments. Also popular for controlling noise stemming from hand held tool assembly areas. Another popular technique for the custom fit, much like a golf glove, is to have NetWell produce a Customized Sound Barrier Jacket that can fit tight to your machine. 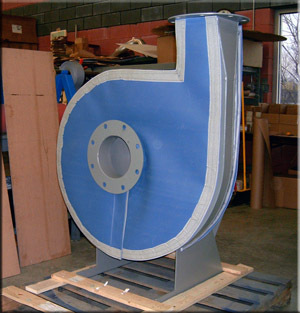 We can work with you to design a customized noise enclosure wrap that can fit tight to your machine, rather than suspend the noise control blankets from a frame built around your machine. 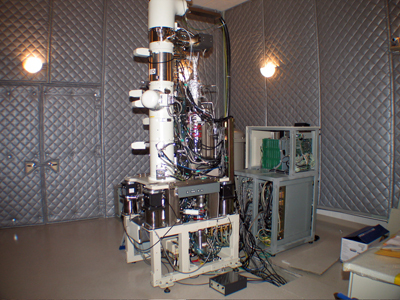 The Oak Ridge National Laboratories contacted Netwell with complaints about their pump rooms. The rooms were fairly tight to their pumps, so no need to build a frame around the units themselves. Instead, we custom cut a set of QBS Sound Barrier Blankets to affix to their perimeter walls to shut down the leakage of their noise out of the pump room. QBS Blankets are class A fire rated. They are easy to hang, they are portable, detachable, easy to keep clean, and combat up to 80% of directional noise. We grommet across the top for ease in self installation, and Velcro down the edges for interconnecting the sections to minimize your leakage points. The blankets can have windows, patches, openings, slits, strip curtains, and more cut into them to make the user friendly for your treatment. We will CAD draw the blankets for your approval on dimensions prior to production. 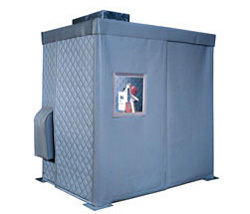 These blankets are the perfect treatment option for most industrial noise control projects. Use this form to submit your basic information to NetWell, and one of our sound consultants will be back in touch with you. We will work quick to define the parameters of your noise reduction project and quote your treatment back. Every industrial noise control application we undertake is unique unto its own starting point. Use this form to reach out to us with the basics of your project, and we will be back in touch with you to explore your soundproofing options and quote your project back.